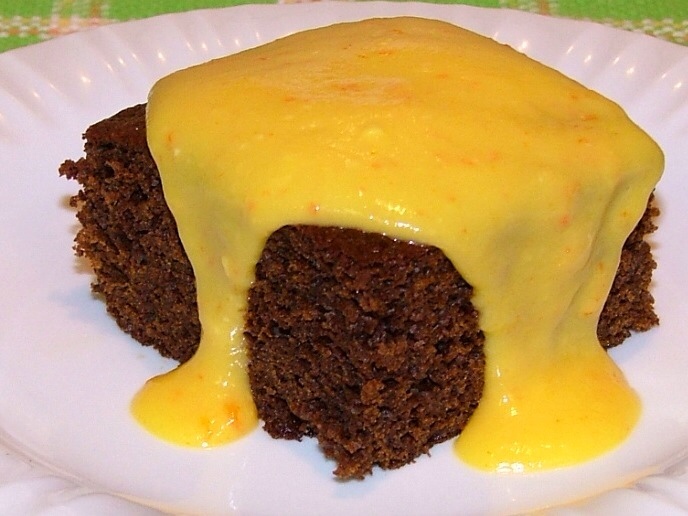 Who doesn't love that moist, spicy cake called, Gingerbread? Add a dollop of fresh whipped cream or top with Microwave Lemon Curd or Tangerine Curd and you have a delightfully refreshing snack. Serve for dessert or, my favorite . . . breakfast with a yummy cuppa tea, coffee or ice cold milk! 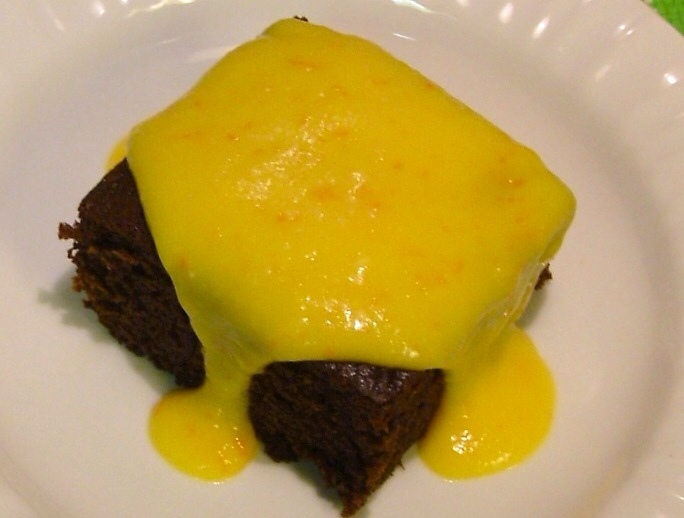 Warm Soft Gingerbread, topped with Tangerine Curd. This recipe was adapted from THE BREAKFAST BOOK by Marion Cunningham. "An invitation to breakfast---with 288 recipes, from the best-ever sticky buns to scones, coddled eggs, pancakes, and new delights like Bridge Creek Heavenly Hots and Fresh Ginger Muffins." Tender, fine-crumbed, spicy, moist cake! Put sugar, molasses, oil, and eggs in a mixing bowl and beat until smooth, using mixer or whisk. In another bowl, combine salt, cloves, ginger, cinnamon, flour, and baking soda and whisk well to incorporate. Add boiling water and beat briskly until smooth. Batter will be thin. Pour into baking pan and bake 40 to 45 minutes. Test with a toothpick, being careful not to overbake. Serve warm. I personally like my gingerbread cold. I love the way the curd pools on the plate as its runs down the sides of the Gingerbread! There's gingerbread and then there's Gingerbread! 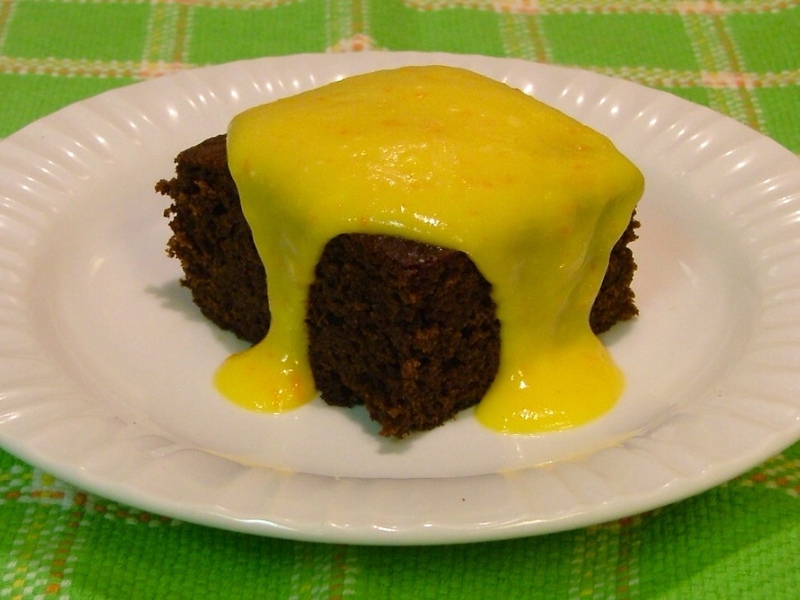 For a gingery taste that's worth "writing home about", whip up a batch of Microwave Lemon or Tangerine Curd to serve over your very own, warm from the oven, Soft Gingerbread! This cake wasn't even out of the oven and Will was drawn to the kitchen by it's spicy aroma! I love to mix it up when it comes to breakfast . . . Over at Julie's!! !